Holland America Line marked International Sushi Day by revealing the Largest Sushi Roll at Sea made on June 9 by Culinary Council Member Andy Matsuda while he sailed aboard Koningsdam on a special Food and Beverage Aficionado Cruise in Norway. The Largest Sushi Roll at Sea was prepared around the Lido Pool so guests could join in the festivities and watch as Matsuda assembled the culinary feat. Once delicately rolled, Matsuda cut the large roll in half so guests could view the swirled ingredients that included rice, salmon, tuna, shrimp, crab, tamago (Japanese omelet), tobiko (flying fish roe), cucumber, red onion and radish. The roll was 49 feet long pre-rolled, and 3.3 feet wide once rolled. It included 150 sheets of Nori seawood, 70 pounds of sushi rice, three pounds each of tuna, salmon and shrimp and one pound of flying fish roe. 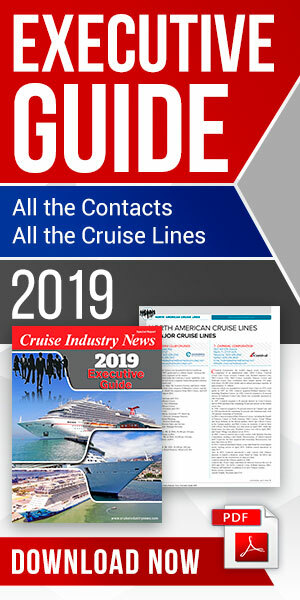 Since 2016 Matsuda has been sharing his knowledge with and training Holland America Line’s shipboard chefs to ensure that the cruise line’s staff is at the forefront of sushi trends and techniques, the company said. Guests can indulge in Matsuda’s signature rolls at Tamarind — the Asian-fusion restaurant onboard several Holland America Line ships — and at Tamarind’s sushi counter on Koningsdam. To further enhance the sushi experience, Nieuw Statendam — Holland America Line’s newbuild due for delivery in December 2018 — will have a separate sushi bar called Nami Sushi that will feature more rolls created exclusively by Matsuda.